An ABC News reporter of color recalls the challenges on the Trump trail. They say you never forget your first. It was February. 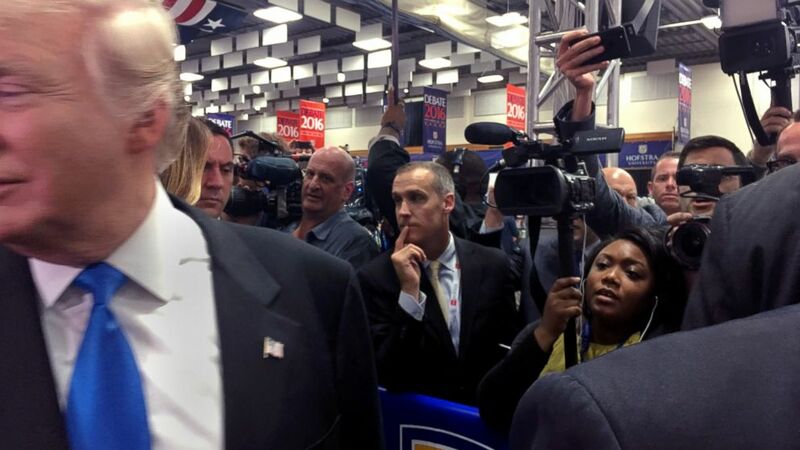 I had just gotten assigned to cover GOP presidential candidate Donald Trump. Jeb Bush, the candidate I had covered since June 2015, had dropped out. In my mind, Trump was sure to be the Republican nominee at that point, and I was en route to Radford, Virginia, for my very first Trump rally. The line to get in seemed endless. Inside the gym at Radford University, thousands of people had gathered, a far cry from the modest town halls I had grown accustomed to covering. I had heard stories of the protests and was on guard. Sure enough, as Trump declared that he would build that infamous wall, protests broke out. One young woman stood, shouting at Trump as he spoke of impending trade wars. He turned to look at her. “Are you from Mexico? Are you from Mexico? Are you from Mexico?” he asked. “Right smack in the middle of my punch line!" he said. And that was my first foray into Trumpland. As we traversed the country, I grew fascinated with the foundation of Trump’s support, these people who seemed so passionate, so fervent … so angry. In Fayetteville, North Carolina, a black protester was being escorted out when an elderly white man punched him in the face. In Louisville, Kentucky, student Shiya Nwamguma was pushed and shoved by an angry horde of white Trump supporters. In Janesville, Wisconsin, I saw a young white woman pepper-sprayed and called a “n----- lover” as she protested outside a Trump rally. When I joined the beat, my mother and grandmother grew worried; they cautioned me to be wary of speaking to people at the rallies, having seen reports of what happened to protesters. (Damon Winter/The New York Times via Redux) Donald Trump speaks during a campaign event at the Pittsburgh International Airport, Nov. 6, 2016. Members of the media are positioned behind the crowd. But as the only black reporter who covered Trump in the field (except for the last week of the election), I lived in a nebulous space. I was a reporter and, by virtue of that, derided by crowds. In this, my experience was not unique. 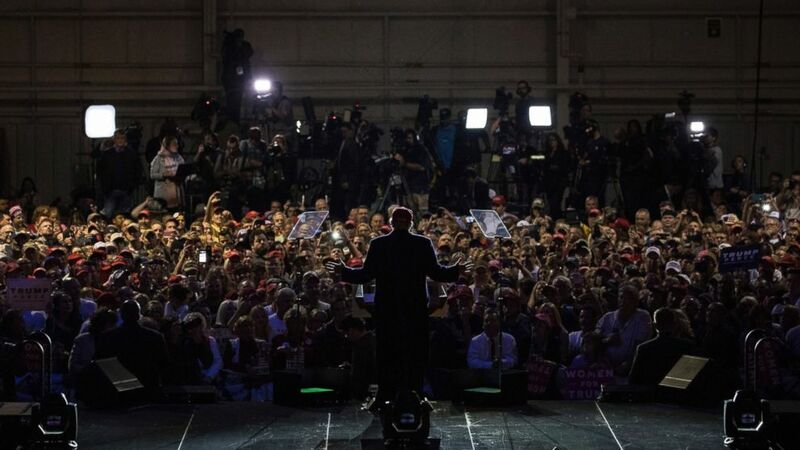 Nearly all those who covered Trump have been booed, given the middle finger, told we are “s---.” At rallies, people have called for us to be killed, along with Hillary Clinton. Social media was much worse. My Jewish colleagues were the recipients of horrifying memes that digitally placed them in gas chambers. In Phoenix a protester chanted at the press pen to which we all were relegated, “Jew-S-A,” as spittle from his mouth fell on us. 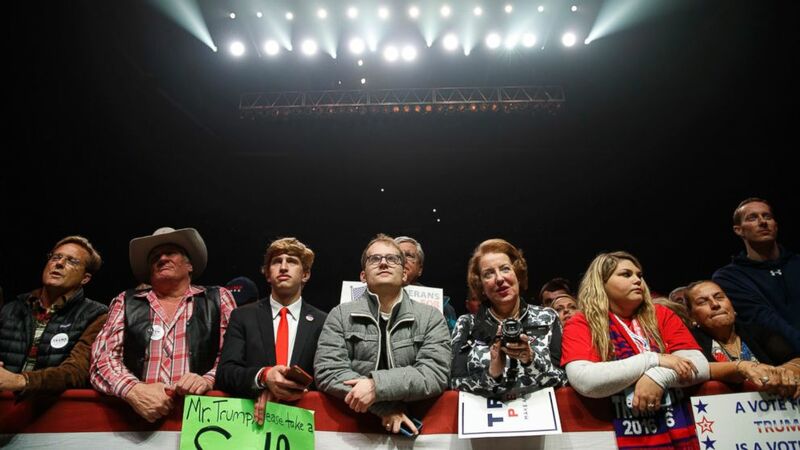 (Evan Vucci/AP) Supporters of Donald Trump listen to him speak during a campaign rally, Nov. 7, 2016, in Manchester, N.H. But conversations with over 100 Trump supporters, all white, revealed a darker truth: that they may like me as a person but were concerned more holistically about what black and brown people were doing to this country and worried about a changing nation that no longer looked like them. “I’m not afraid to say that I’m in fear for the white man. I’m in fear,” Brian Patterson told me in North Carolina. He had voted for President Barack Obama but worried about racial tensions, feeling Obama had exacerbated them. Jayna Knowlton, who confided in me that she had been called a bigot and racist, said she merely wanted her country back. “I want my kids to know freedom,” she said, adding that whites “absolutely” are discriminated against and she is concerned that the country is growing too diverse. And then there was Frank Meeker, in Prescott Valley, Arizona, who was concerned about undocumented immigrants and terrorists coming from the southern border. When our interview concluded, he unfurled a flag he had been keeping under his legs. It was a flag proclaiming states’ rights, with “Don’t tread on me” emblazoned over a flag. But instead of the usual yellow background, it was a Confederate flag — in Arizona, which was only a territory during the Civil War. Confederate flags seemed omnipresent. I saw them in Pittsburgh, in North Carolina, in San Diego and in Florida. When I noted the flags, people on Twitter would ask why I was so obsessed with race. But race — as a black woman in America — is something so many of us are acutely aware of. It is the lens through which everything is filtered. For a long time, Trump didn’t address race directly on the stump. He had retweeted false statistics about black-on-black crime and was sued in the 1960s for allegedly barring tenants of color from his New York City rental properties. He perpetuated the lie that Barack Obama, the nation’s first black president, was not born in this country. But then, in early August, he began to appeal to “the African-Americans,” proclaiming that we lived in inner cities where “you walk down the street and get shot.” He painted a grim picture, saying there were no jobs, no education, no promise. He ignored the evidence that more black people in this country live in the suburbs than anywhere else or that, according to 2015 census data, 52.9 percent of black Americans age 25 or older have attended some college. Many of his supporters on social media have changed their avatars to a picture of Pepe the Frog, a symbol of the alt-right, a white nationalist movement. Trump called for temporarily barring Muslims from entering the U.S. and would famously recite the poem “The Snake” to liken refugees to a snake lying in wait to kill freedom-loving Americans. But in spite all this, Trump is the man that America elected to be president — a candidacy that was as unprecedented as it was polarizing. He often proclaimed that African-Americans and the Latinos “love me.” An analysis of exit polling reveals that Trump garnered 8 percent of the African-American vote — larger than the share captured by Mitt Romney — likely a benefit of his not running against a black man. But Trump did not win the “95 percent” of the black vote he said he’d accrue. His victory was carried instead on the backs of white voters who turned out in droves for him. In many states, including Florida and North Carolina, it was the increased white turnout that thrust him to victory. The country’s vote was split along racial lines, once again. On election night, a friend mused about what his election meant, how it could have happened. “It’s the undying power of white supremacy,” he said. A new chapter in U.S. history unfolds. Election night is when the people’s voices are heard, their votes traditionally seen as the nation’s referendum on the ideas and choices presented to them. But this election gives no such clarity. We’re left with an uncertain path forward and questions that have no clear answers. Will we ever again live in states that are united? Were we ever, really? (ABC News) ABC News' Candace Smith films Donald Trump during the second presidential debate at Hofstra University in Long Island, N.Y., Sept. 26, 2016.